Sometimes the kitchen appliances might be more important than the kitchen itself. If you think clearly that without these appliances you can’t do your cooking even if you have the skill. So for you who love to spend your time in the kitchen cooking for your loved one, you definitely need to mind about your kitchen appliances. In this case, we have the interesting cutting board which is the Epicurean Cutting Board. This cutting board is made of Richlite, eco-friendly, and wood composite material which is non-porous. This product has been known for the eco approach which very good for the environment. This method is somehow very dedicated for you who loves using the natural product. So if you are interested in this product, let’s see the explanation below. Epicurean Cutting Board is coming and made from the USA, the company is using the harvested trees under the guidelines of North America sustainable forestry standards. It is a very promising and well-structured cutting board which has a standard cutting board size; it boards measure 14-1/2 by 9-1/2 by 3/16 inch thick and ten by seven by 3/16 inch thick. It is safe for all knives, and the cutting board can stand up to the heat up to 350 degrees. Epicurean is also dishwasher safe, and it won’t harbor bacteria. Last but not least, you can find that this product is green guard certified which means that the manufacturer uses the sustainable manufacturing practices and minimal, recyclable packaging. The Epicurean Cutting Board is very decent in our first sight; the board is pretty thin and lightweight which is good for the woman. The endurance itself is pretty fantastic; you can find this cutting board stays pretty even after so many times used in the dishwasher or even used roughly by some unprofessional users. Another good point is that this product won’t need too much care and maintenance, you won’t need to oil the cutting board at all. 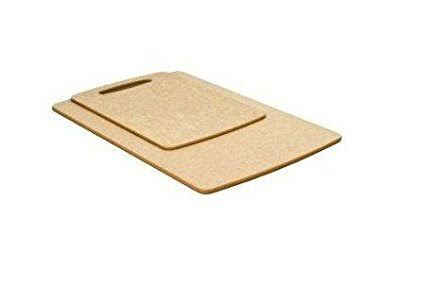 After that, you need to keep in mind that by using this cutting board it means that you are supporting the eco-friendly project because this product is the prime example of the eco-friendly product. The downside is that Epicurean Cutting Board needs to be put on some layer. It means that you must put something on the cutting board because it is pretty lightweight that it can move on its own. The best choice is probably the paper towel or a thin towel. In overall Epicurean Cutting Board is a very well-structured product which offers tons of advantages compared to other cutting board. It is also an eco-friendly product which is good. The performance and durability are also pretty decent. The only thing that you need to keep in mind is about its stability as it can easily move on its own while you are cutting. Check the best price for Epicurean Cutting Board here!